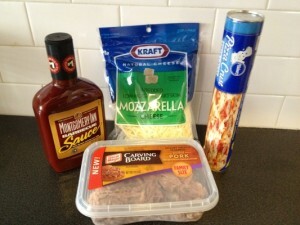 For tonight’s pizza we decided to do a Pulled Pork Pizza with Montgomery Inn sauce. 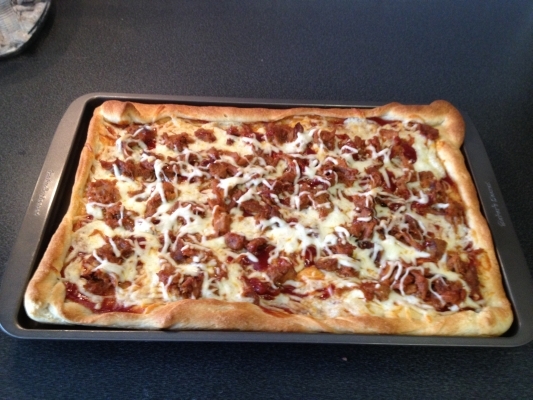 I used the Montgomery Inn BBQ sauce as a base instead of regular pizza sauce. It turned out great and with the FREE pulled pork from the Oscar Mayer Facebook promo, it only cost $3.00! This is my own recipe and I think it works pretty well. I have also added the recipe card at the end of the post. Spread out dough on cookie sheet and pre-bake for 5 minutes at 400. While this is baking take about half the package of pork and make sure it is shredded well and add enough BBQ sauce to get good coverage and microwave for 1 minute. 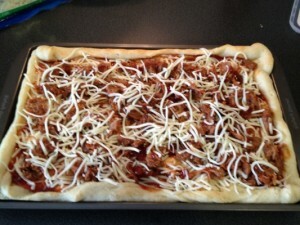 Remove the crust from the oven and apply a thin layer of the BBQ sauce to act as a base for the pizza. I then apply a thin layer of cheese, making sure to get coverage all the way to the edges. Drop chunks on the pulled pork around to try and get even coverage for each piece and then add another thin layer of cheese over this. Put it back into the oven for about another 8 minutes or until cheese is melted and crust is brown. 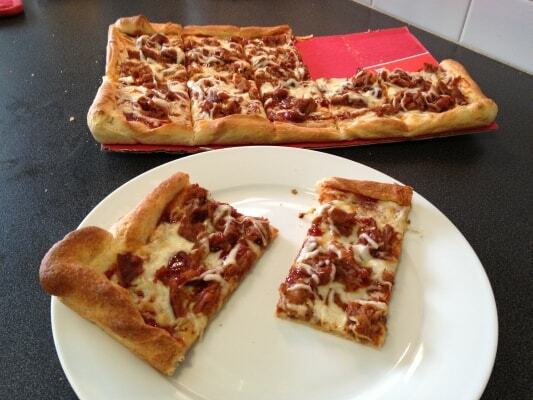 Slice and serve for a real Cincinnati taste! Spread out dough on cookie sheet and pre-bake for 5 minutes at 400. While this is baking take about half the package of pork and make sure it is shredded well and add enough BBQ sauce to get good coverage and microwave for 1 minute. 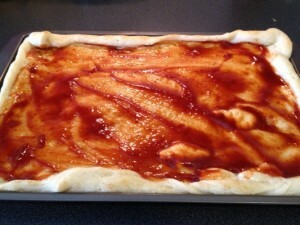 Remove the crust from the oven and apply a thin layer of the BBQ sauce to act as a base for the pizza. I then apply a thin layer of cheese, making sure to get coverage all the way to the edges. Drop chunks on the pulled pork around to try and get even coverage for each piece and then add another thin layer of cheese over this.